Monterey 2014 collector car auction sales saw 98 cars selling for more than a million dollar each. A 1962 Ferrari GTO set a new world record at $38 million. The car auctions during the annual Monterey classic car week usually achieve the highest results of the year as well as the highest number of cars selling for over a million dollar each. The 2014 Monterey auctions were no exception: a 1962 Ferrari 250 GTO achieved a new world record price of $38 million making it the most-expensive car ever sold at public auction. 98 cars, including 37 Ferraris, achieved results in excess of $1 million each. The RM Auction was the highest grossing classic car auction ever. Seven of the top prices this year was achieved during the Monterey 2014 week. Most-Expensive Lot: 1962 Ferrari 250 GTO – $38,115,000 at the Bonhams Quail Lodge auction in Carmel. Highest Grossing Auction: RM Auctions earning $143 million in two sessions – a new record for a single auction. RM Auctions also set a day record of $88 million – earning well over $20 per auction hour. Largest Number of Cars Sold – around 750 by Mecum at three sessions in Monterey. Highest Unsuccessful Bid – $22 million for a 1966 Ferrari 365 P Berlinetta Speciale Tre Posti at Gooding’s Pebble Beach sale. Number of Cars Selling for over $1 million: 98 cars, including 37 Ferraris. Most-Common Million-Dollar-Plus Car Model: 13 Mercedes Benz 300 SLs (5 Gullwing Coupés and 8 Roadsters). Most-Common Ferrari Model No: 17 Ferrari 250s – spread over at least 12 model versions and 8 Ferrari 275 GTBs. Oldest Million-Dollar-Plus Car Sold: 1908 Napier Type 23A by Bonhams. Newest Million-Dollar-Plus Car Sold: 2013 Bugatti Veyron 14.2 Grand Sport Vitesse by RM Auctions. The annual Monterey classic car week held in mid-August in California, USA, is traditionally accompanied by several high profile collector car auctions. In 2014, RM Auctions, Gooding & Co, Bonhams, Mecum, Rick Cole, and Russo and Steele all achieved single-car results in excess of a million dollar each. RM Auctions had a hugely successful Monterey 2014 sale setting a new collector car auction record when realizing $143 million in two sessions. RM Auctions also set a new single-day record when earning $88 million – a rate of over $20 million per auction hour. RM Auctions top result at Monterey 2014 was $26 million for a 1964 Ferrari 275 GTB/C Speciale – the second most-expensive car sold during Monterey 2014 and all-year. RM Auctions sold 35 cars (15 Ferraris) for over a million dollar each at Monterey 2014. RM Auctions had 129 cars on offer with a sell-through rate of 91%. See 2014 RM Auctions Monterey Classic Car Sale Results for more details. Gooding and Company had a fairly successful 2014 Pebble Beach auction realizing $106 million. The bottom line got somewhat hurt by two high-profile lots that failed to clear the reserves: the third highest bid of the week was $22 million for a 1966 Ferrari 365 P Berlinetta Speciale Tre Posti while a potential marque record opening bid of $9.5 million for a 1995 McLaren F1 also failed to pocket the car. Gooding’s top result was $15 million for a 1961 Ferrari 250 GT SWB California Spider – the third-highest result of the week and a new model record. 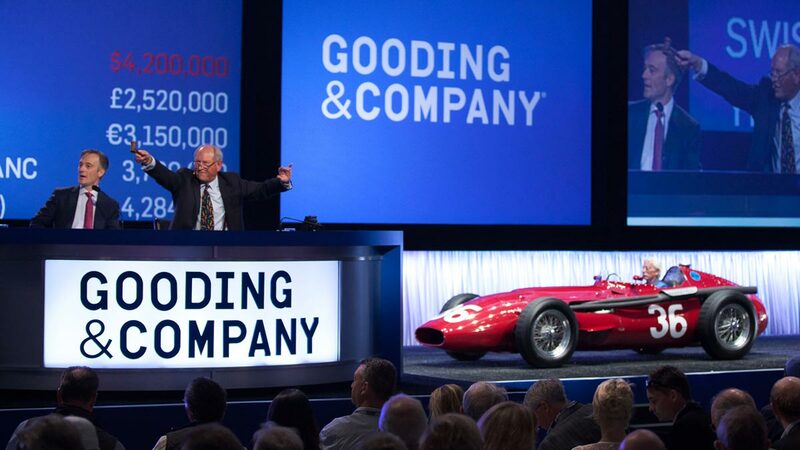 Gooding sold 30 cars (9 Ferraris) for more than a million dollar each at Pebble Beach 2014. Gooding & Co had 121 cars on offer with a sell-through rate of 88%. See 2014 Gooding Pebble Beach Classic Car Auction for more details. Bonhams became the talk of the motoring world when a 1962 Ferrari 250 GTO sold for $38 million at its 2014 Quail Lodge sale in Carmel. This was the highest price ever paid for a car at public auction and naturally makes it also the most-expensive Ferrari ever. See 2014 Bonhams Quail Lodge Classic Car Auction Results for more details. Mecum Auctions had 650 cars on offer at Monterey 2014 selling fast at three daytime auctions. Mecum’s sell-through rate was 56% to earn almost $35 million – the highest Monterey result for Mecum ever. Mecum’s top result was $2,475,000 for a 1961 Ferrari 250 Series II Cabriolet – the 26th highest result of the week. The highest bid at a Mecum Monterey 2014 auction was $5.75 million for a 1955 Ferrari 375 MM Spider. Mecum Auctions achieved more than a million dollar on 7 cars (1 Ferrari) at its Monterey 2014 auctions. See 2014 Mecum Auctions Monterey Classic Car Sales Results for more details. Rick Cole had an internet-only classic car auction with 35 cars on offer. Rick Cole sold 5 cars (all Ferraris) for over a million dollar each with a few further cars expected to sell post-auction for well over a million dollar. Rick Cole’s top result was $12 million for a 1965 Ferrari 275 GTB Competiziione Clienti – the fourth highest result during the Monterey 2014 week. The highest bid was $22 million for a 1955 Ferrari 410 Sport. Russo and Steele achieved two results in excess of a million dollar. 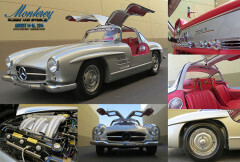 Both were for Mercedes Benz 300 SL cars – $1.3 million for a 1956 Mercedes Benz 300 SL Gullwing and $1.2 million for a 1957 Mercedes Benz 300 SL Roadster.